Ask any women in her thirties and beyond what is most important to her about her looks, and I’m willing to bet most would say more youthful, healthy-looking skin. Here in the US the fountain of youth always seems to be in high pursuit. A lot of us women are looking for those products that will really help us look and feel younger, especially when it comes to our skin. As a beauty blogger, I get to try tons and tons of different beauty brands, and while some provide ok results, most take a long time to work or don’t really provide much of a benefit at all. I recently got to try out the Monsia Skin Advanced Renewal Skincare System and have been nothing short of impressed. While trying out the skin care system for the last 3 weeks, I have seen more healthy, vibrant, youthful looking skin! Not only that, but my skin FEELS much more youthful too! Find the best deals at Beautytap! As a woman in her thirties, I tend to be mostly concerned with dull skin, sun spots, and a few noticeable wrinkles. This is the age when you really start to notice differences in your skin, and most of it is not pleasant. There is constantly a lot of pressure on women of this nation to look younger. There probably aren’t many of us out there who aren’t doing something to fight the battle of aging! In the last few years I’ve seen dramatic differences in my skin, all of which I want to eliminate. I’m suddenly regretting all the time in the sun where I didn’t listen to my mom and apply sunscreen regularly. I also wasn’t faithful in washing my makeup off every night and feel like my skin is now paying the price for all of my past bad behavior. Luckily there is a brand of skincare that can help you overcome your skin misdeeds, and help you find a more youthful appearance. 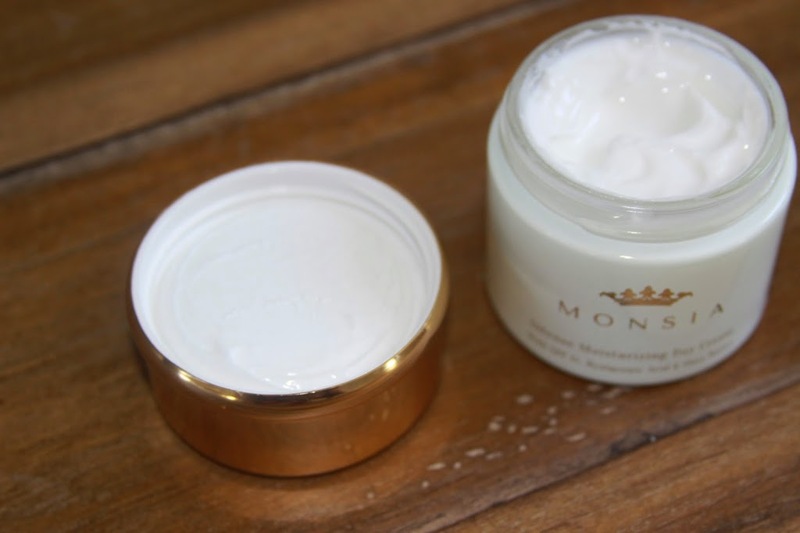 Monsia Skincare has carefully combined some of the most effective ingredients for helping fight signs of aging, and restoring a more supple, healthy, youthful glow to your skin. These products work to fight both intrinsic (the natural signs of aging) and extrinsic (pollution and the sun) factors that are effecting your skin everyday, and making you look older. When my skin renewal system showed up, I couldn’t wait to try it out! The system comes in a pretty little box and all of the bottles and jars are so exquisite, It makes me feel like I’m at a luxurious spa just looking at them. I kept them out on my counter the whole time I’ve been using them, just because they look so fabulous! When I received my products, I started by washing my face with the cleanser. The cleanser is extremely rich and creamy. I loved using it because my skin tends to be on the dry side and this cleanser is so incredibly moisturizing. It leaves my skin feeling so soft and moisturized, which is pretty rare to find in a cleanser. They often can be drying and leave the skin needing some intense moisturizer. I would wash my skin and walk away for a few minutes and think, wow It doesn’t even feel like I need to apply the night cream! I can’t say I’ve ever felt that way before about a cleanser! The cleanser contains super hydrating shea butter and jojoba oil, which I’m pretty sure I’ve never seen in another cleanser before either! The cleanser also comes with gentle, exfoliating microbeads, so you can get some great exfoliation from this cleanser too. It washes away the dead skin, and leaves you with more youthful, vibrant- looking skin. I then used the toner. While I’m not a huge fan of toner, in fact I rarely use it, I was pleasantly surprised with this toner. It’s not harsh and drying at all (which is why I tend to avoid toners). Again, you can walk away after using this toner for a few minutes and almost not even feel the need to add your night cream to your face. The toner contains super moisturizing shea butter, as well as hyaluronic acid, which is well-known for being a huge anti-aging agent! Hyaluronic acid has been proven to show reduction in sun spots, wrinkles, and scars, as well as give skin a nice healthy glow. It’s also a very moisturizing agent as well and can hold up to 100 times its weight in water! Like I said, I have dry skin, but I was using this toner day and night and my skin has never dried out a bit. I also loved how much dirt I saw it pull up off my face, even in the morning! I’ve used lots of toner’s where you would get a little dirt, but I was always amazed with how much grime, makeup, and other nasty things this toner would pull up from my skin. In the Monsia Advanced Skin Renewal System, you also get a wonderful day and night cream. 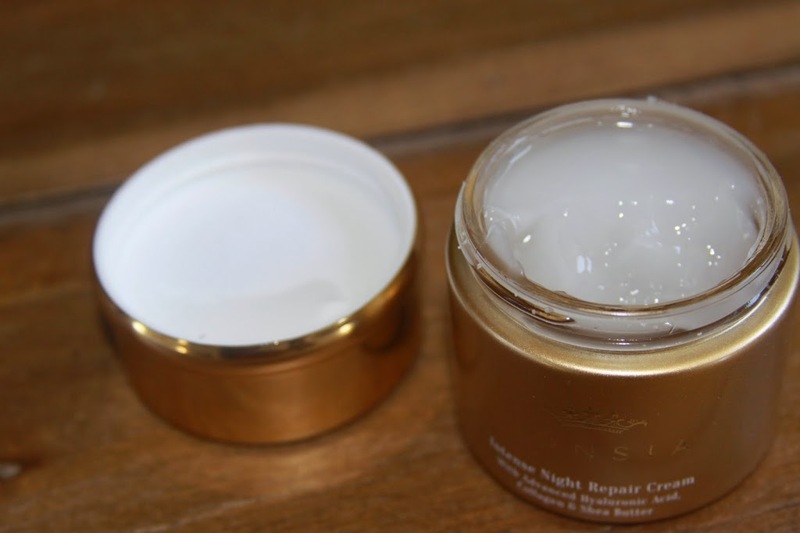 The Night Cream is more like a gel, I found that to be somewhat interesting, and wondered if it wouldn’t be as hydrating, but I was completely blown away with it’s moisturizing ability. I used it on my face, my neck (front and back) and the back of my hands. All of these parts have felt absolutely amazing while using this Intense Night Repair cream. Although it is a gel, it works just like a rich, creamy, night cream. My skin felt immediately softer, more supple, and smoother after use. My hands tend to get really dry and that is where I’ve noticed the biggest difference. The backs of them look so much more youthful. They feel soft and incredibly supple. You will once again find hyaluronic acid, shea butter, as well as collagen, in the night cream, to help restore a more youthful look to your skin. As you can see, you’re getting super hydrating, anti-aging ingredients in all of the Monsia skincare products! You may be wondering by now if you suffer from acne, if all these moisturizing and rich, creamy formulas are going to make you break out a bit. I tend to suffer from acne here and there and experienced no acne while using these products, even around that time of the month which almost always gives me a pimple or two. Last up is the day cream. I absolutely loved this day cream. It contains SPF 15, as well as once again, Hyaluronic acid, and shea butter. It feels rich and creamy, not at all thick and over powering like some products with sunscreen can be. The sunscreen is also great and I used this in conjunction with a regular sunscreen while spending all day, every day in the sun this last week on my recent vacation, and my skin didn’t burn at all, even though I was bad about wearing my sun hats. I’ve used a lot of skin care products, and this line is by far one of my very favorite lines I have ever tried. All of the products contain powerful anti-aging, and super moisturizing ingredients, to really give your skin that extra boost of youth. My skin has looked and felt so much more radiant while using my Monsia skincare line, and I’ve had a really nice glow to my skin as well. I’ve even been getting compliments on my skin lately! Wow! My super dry skin has been so incredibly moisturized, soft, and supple while using this line. I don’t ever want to use anything else again! I can feel that my skin loves these products as much as I do! And for the question of the hour, what anti-aging benefits did I see? Well, I was INCREDIBLY impressed with the results of these products. This time of year, I’m outside all the time, in the sun, not always faithfully wearing my big sun hat, and even when I am, I seem to have sun spots popping up every day anyway. This is my single biggest skin care concern. While using my Monsia skincare line, I’ve noticed a dramatic result in my skin tone becoming more even. I haven’t had any new sun spots pop up and the ones that are there have been reduced significantly. My skin looks so much more even, I even went out one day to lunch without any base on! I haven’t done this in years! I have also been wearing a very light BB cream and have felt completely comfortable in it. It hardly covers my face but I haven’t felt the need to wear anything super thick or with intense coverage, as I have really been pleased with the natural look of my skin while using this skincare line. I also have a few wrinkles and crows feet around the eyes and have not even noticed them while using this line. My eyes have especially looked more youthful, and I’ve also had no dark circles or puffy eyes while using these products, even though this line doesn’t come with an eye cream! It’s like you don’t even need one while using these products! I could go on and on about this amazing skincare line but you really need to try it out for yourself! I’m really betting you will be amazed with the dramatic results it can bring your skin, and in such a short amount of time! Be Sure to shop Monsia Today and get started on finding your more healthy, youthful looking skin! Visit them at MonsiaSkincare.com to learn more about their wonderful line of products and purchase some for yourself! Organic + Vegan Beauty Specials! Discover the purest beauty source out there. Debbie Thomas – It looks just fantastic! Packaging to Performance is great! Sounds like it’s worth trying! I am always looking for new skin care products. I have combination skin and I break out easily! I’d like to try this and the packaging is cute! I need anti aging products since I am already almost 48 years old. Thank you for the very in depth review! I will have to look into this!! This looks amazing but it’s $300! I could never afford that. I would love to try the day cream because it has Hyaluronic acid, and shea butter in it. I have dry skin as well and would love to try their cleanser! I received my gift just before Christmas, 2014, but I opened it immediately. First impression – QUALITY. Now having used the product for almost two and a half months I don’t think I’ll be giving it up. In fact I have recommended it to several of my friends already. Hey Cindy they have added Monsia Skin Lightening Cream and Acne Treatment System. OMG I didn’t even realize that Lin! Thank you so much for sharing! Will def be checking that out! Especially the Lightening Cream! I actually do, on the right hand side at the bottom (on desktop) at the very bottom of the page (on mobile). Thanks so much for all your support! I truly appreciate it so much!